"You Can Never Get Too Much Of A Good Thing!" Well, maybe not, but we sometimes do! And when that happens, it's GOOD NEWS for you, because it means having another "OVERSTOCK SALE!" Great Stuff at even Greater Pricing combined with Super Low Flat Rate shipping!! And don't forget you can also combine "sales items" with other stuff to get FREE SHIPPING! All of our "On-Sale" Stuff is grouped together here for your convenience; buy you'll also find them throughout the store. Please drop by often! You never know what you'll find and additional stuff is added all the time! Please visit these links for complete details, special pricing & availability! 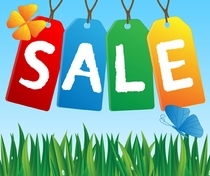 ON SALE NOW - Huge Savings - Up To 40% Off List!